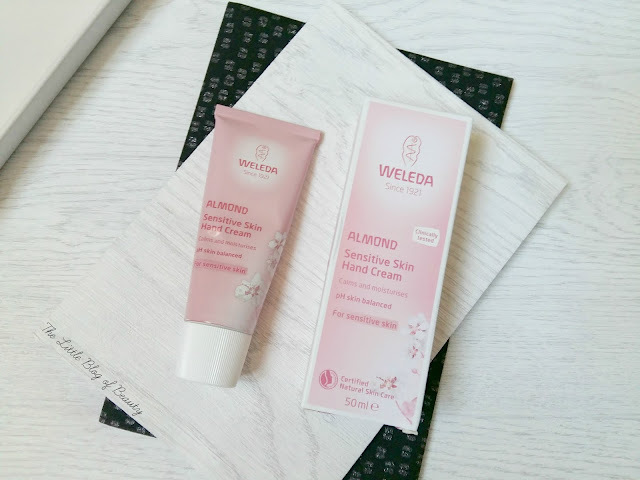 Weleda are a brand that I am aware of but I believe I've only tried one sample size product that I received in a beauty box or some kind of goody bag. The product I tried was a day cream from their Wild rose range and I enjoyed using it and made a mental note to try more of their products in the future. Weleda are a natural brand created in 1921, originally in the area of holistic and homeopathic medicine, and they grow a lot of their ingredients for their medicines and products themselves not far from me in Derbyshire. Their products are free from synthetic chemicals, fragrances, preservatives and anything else synthetic. There's a huge amount of information about the brand on their website that would take forever to try and summarise here so it's probably best if you head over there to take a look if you'd like to know more about the brand. Towards the end of last year I was sent their Almond Soothing cleansing lotion* and Almond Sensitive skin hand cream* to try. As I mentioned in my last post on tips for dry/dehydrated skin, cream cleansers that you apply to dry skin with cotton wool or a cotton pad tend to irritate my skin and leave it sore and unfortunately that was also the case with the Almond Sensitive Skin Soothing Cleansing lotion. This was one of the better ones I have tried though and there was only slight discomfort after use. I feel it's important for me to point out that this is nothing against the product itself, there's just something about my skin that does not like cleansing lotions. I used the lotion to remove my make-up and it did an ok job. It took several cotton pads to remove it all but I find this pretty standard across all cleansing lotions as I don't find them to be the best method for removing my make-up. I find it a little strange though that the box states the product is suitable for the removal of make-up but that you should avoid the eye area. So you would need to use another product to remove any eye make-up. I've passed this on to my mum who does use cleansing lotions to remove her make-up. After not using any hand cream at all for most of my life it's now something I'm pretty dependent on as my hands can get really dry and I end up picking at the flaky bits of skin I get around my nails. If I'm going to use a hand cream throughout the day it has to do two things; absorb quickly and not leave any kind of greasy or sticky/tacky residue behind. If it doesn't meet those requirements I'll probably still use it but it'll be relegated to the 'before bed' pile. The Almond Sensitive Skin hand cream is a nice light cream that does contain fragrance and as the name suggests has an almond fragrance that reminds me a little of marzipan. I find if I rub this one in too much it does start to pill a little so I tend to rub it in a bit and then leave it to sink in by itself. It absorbs well but does leave a slightly oily feeling on my finger tips that needs a few more minutes to disappear. Although the hand cream hasn't blown me away it is a nice hand cream and is one that I would consider using through the day if I didn't need it to absorb pretty much straight away. It does leave my hands feeling soft and smooth and helps get rid of any flaky bits I have. 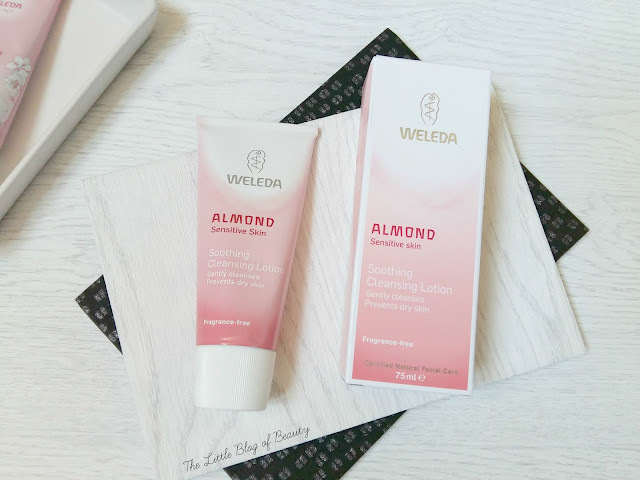 The Almond Sensitive Skin Soothing cleansing lotion is £9.95 (currently on offer for £7.96) and the Almond Sensitive Skin hand cream is also £9.95 (and also currently on offer for £7.96) and both are available from the Weleda website. Have you tried any Weleda products?